Gmail offers powerful customization options even if you don’t install a single browser extension. You can switch keyboard shortcuts on and off, modify individual shortcuts, enable experimental features, and more. But there are some things even Gmail’s extensive customization settings can’t do, and that’s where these free Chrome extensions shine. 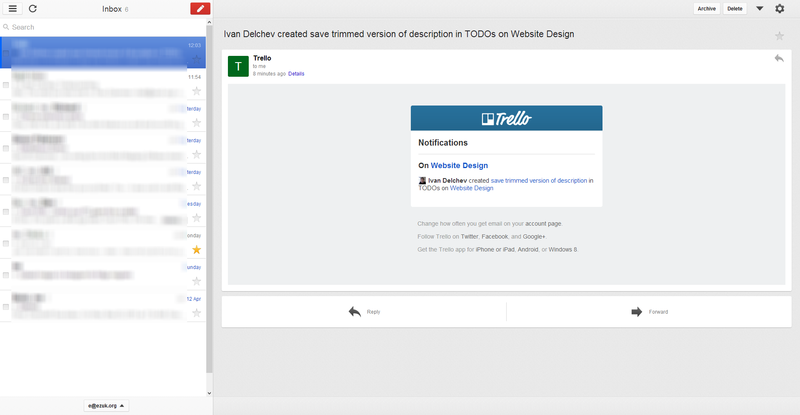 They range from gentle tweaks to a full-blown Gmail makeover. You decide how drastically you want to change Gmail. Before changing Gmail or piling on the extensions, it’s a good idea to master what it can do straight out of the box. Keyboard shortcuts are one of Gmail’s best features: They let you compose, archive, forward, and reply to messages; move between labels; search; and more—all without reaching for your mouse. Alas, they’re also hard to learn. After enabling keyboard shortcuts in the Settings screen, you can press the question-mark key on your keyboard to summon a semi-transparent overlay listing all shortcuts. But for many of us, looking at a long list isn’t the best way to learn—and KeyRocket for Gmail thinks it can do better. Every time you use the mouse to do something your keyboard can do, KeyRocket for Gmail lets you know the keyboard shortcut. KeyRocket sits in the background as you use Gmail and quietly watches your every move. As soon as you tick the checkbox next to a message, up pops a discreet notification informing you that you could have just pressed the X key on your keyboard to do the same thing. When you click the Reply button, KeyRocket informs you that pressing R on your keyboard would have worked just as well. Because the messages are contextual, they are much more useful than a help sheet: You learn in bite-size chunks, and only about those functions you actually use. KeyRocket makes key combinations easy to learn. The one shortcoming to this contextual coaching is that KeyRocket doesn’t learn as it watches you. It should be able to tell when you already know a shortcut and just prefer using the mouse every once in a while. For example, if I type the pound-symbol key (#) to delete a message most of the time, KeyRocket shouldn’t tell me about the ‘#’ shortcut every time I break from routine and use the mouse. Despite this minor flaw, however, KeyRocket is an excellent learning aid for Gmail. Most emails consist of just plain text, although Gmail’s excellent message editor lets you do some formatting without reaching for the mouse (press Ctrl-K to insert a link, for instance). But sometimes you may want to use a bit of extra formatting—like, say, for a headline. Or perhaps you often email code snippets and would like to use some automatic syntax coloring. 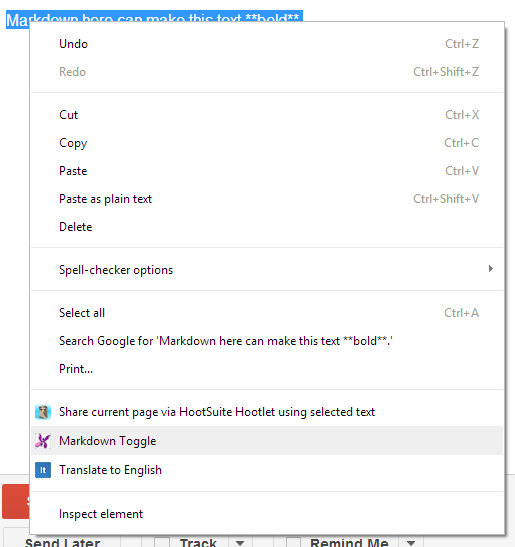 Markdown Here is an unobtrusive extension that lets you use the popular Markdown plain-text-to-HTML converter within Gmail to convert your text into well-formed HTML. Markdown Here offers fine-grained settings for controlling the CSS that’s included with your formatted emails. With Markdown Here, you can write an email using Markdown, and then press Ctrl-Alt-M and watch it transform into a beautiful, richly formatted message. You can apply syntax highlighting to code listings, use multiple levels of headlines, and more. Don’t like the formatting? Press the Markdown shortcut again (Ctrl-Alt-M), and your email reverts to plain text so that you can tweak it. You can also use Markdown Here when replying to an email: Just highlight the part of the message you wish to format with Markdown, and press the key combination. That combination doesn’t have to be Markdown’s Ctrl-Alt-M; I like to use just Alt-M, and Markdown Here lets me customize that. 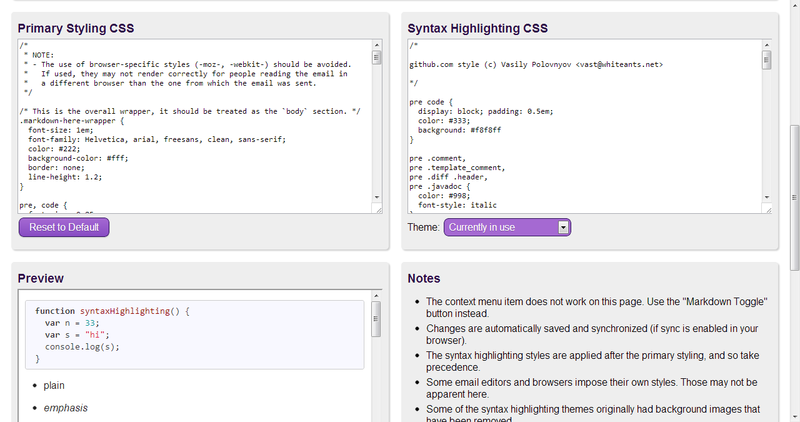 And if you often email code snippets, you can even pick one of several themes for syntax-highlighted code. Note that adding HTML and CSS to email messages can cause problems with some email clients, so if you’re using this for a mailing list, offer a plain-text version as well. When I send an email, I often want to be reminded if the recipient hasn’t replied within a few days. Follow-up, unfortunately, is a feature that Gmail lacks. That’s why I was so happy to find Right Inbox for Gmail. Right Inbox for Gmail makes it easy to specify when you want to be reminded of an email, and whether or not you want to track it. Right Inbox for Gmail is just one option in a highly competitive market of email-reminder and follow-up services. There’s Boomerang, which is pretty costly if you’re using Google Apps ($15 per month). Followup.cc is client-agnostic, but that also means it doesn’t integrate into Gmail. Right Inbox for Gmail offers seamless integration and an affordable price. This $5-per-month service adds a couple of new buttons that blend in well with Gmail’s native ones. Click them, and presto: You can now follow up on and track emails. 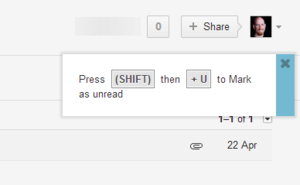 When composing a new email, just click the Remind Me button to set a follow-up time. Right Inbox for Gmail offers several preconfigured times, ranging from a set number of hours to ‘tomorrow morning’ or ‘tomorrow afternoon’. You can’t configure your own favorite intervals (one of the service’s few annoyances), but you can pick other intervals using a calendar pop-up. When a recipient opens your tracked email, Right Inbox for Gmail sends you a detailed report including the recipient’s location and IP address. 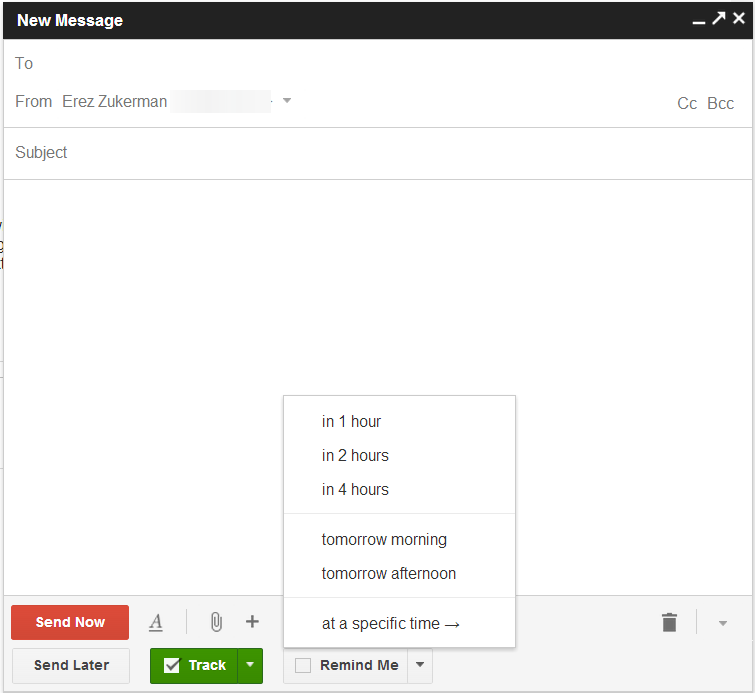 Right Inbox for Gmail also lets you schedule emails to be sent automatically at a later time. 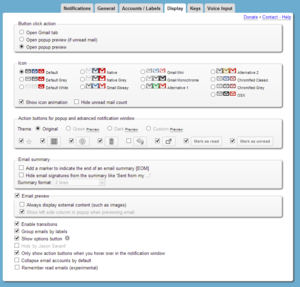 You can also set email tracking to notify you when a recipient opens an email. Tracking uses a small, invisible image embedded into the email, so it works only if the recipient opts to display images included with the email (many email clients don’t display images by default). Email notifications are like coffee: Some people can’t stand them, while others are addicted and even use notifications to wake them up in the morning. Those in the latter camp may like Checker Plus for Gmail. Like every other mail checker, it lets you know when new emails arrive ... but that’s where other email checkers stop and Checker Plus is just getting started. 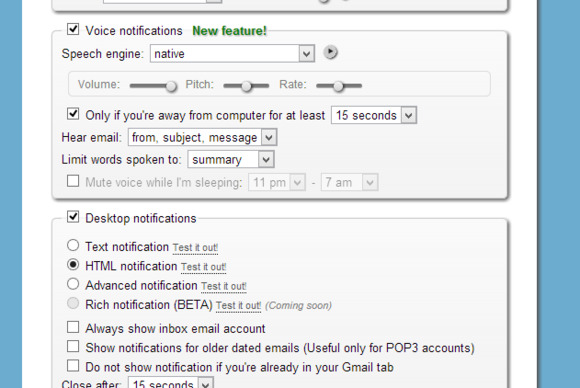 Checker Plus for Gmail can read email notifications aloud—not a feature you’d want to use in a crowded office. Checker Plus lives as a small button on the Chrome toolbar, showing a tiny unread message counter. 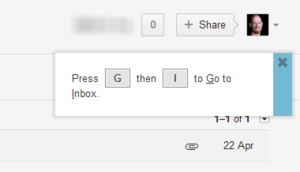 Click the button, and a complete, working mini-Gmail interface pops up over the current window. You can view your inbox, archive messages, directly open them, and more. Checker Plus also shows a pop-up window whenever a new email comes in. The pop-up includes the basic details of the email so you can decide whether to respond now or later. It can also chime an alert and read aloud some information about the email, so you know what it’s about even if you aren’t looking at your Web browser. By default, the read-aloud option is enabled only if your keyboard is inactive for a short period of time (you can adjust the interval). Checker Plus lets you customize everything from the notification icon’s theme to the way summaries are formatted in the notifications. Checker Plus’s rich customization options let you choose how you wish to be alerted (or interrupted). 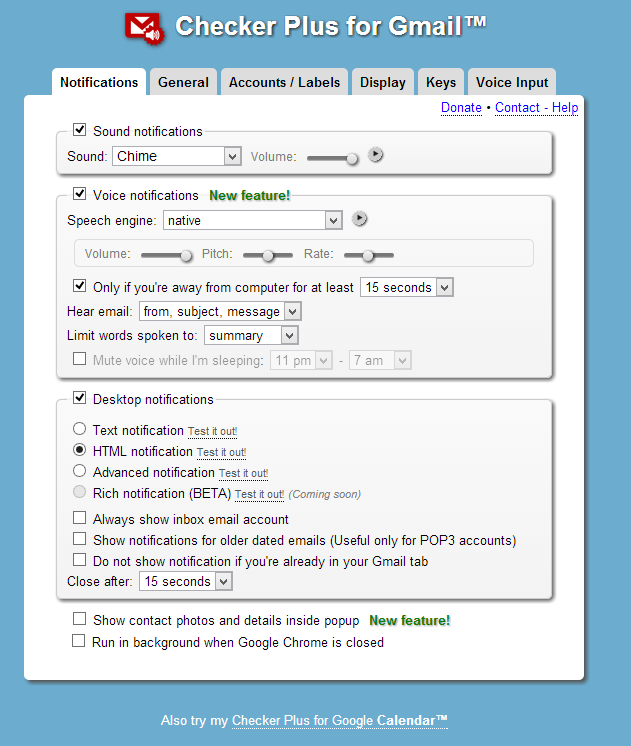 You can enable or disable chimes, text-to-speech, and pop-up notifications. You can set alerts for specific email labels, select a color scheme for the pop-up notifications, and even tweak the appearance of the toolbar icons in minute detail. It’s one of the most configurable Chrome extensions I’ve seen yet. Nevertheless, it’s still an email notifier, which can be as distracting as it is helpful. All the extensions discussed so far sit on top of Gmail’s regular Web interface—some invisibly (like Markdown Here), and some subtly (like Right Inbox). If you were looking over someone’s shoulder while they used Gmail, you could easily miss them. This next one, however, might cause a few double-takes: Gmail Offline, an extension by Google, puts a completely different face on Gmail—one that resembles the Android tablet version. Even if you’re working while connected, you may appreciate Gmail Offline’s clean, uncluttered looks. 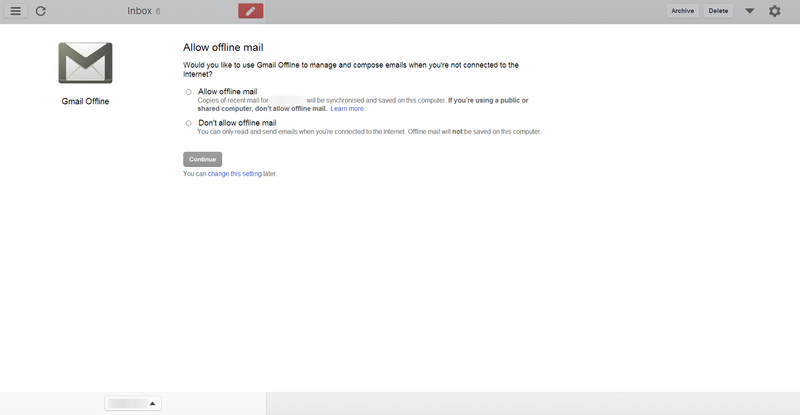 To me, Gmail Offline is a bit of a misnomer. Yes, the extension lets you use Gmail without an Internet connection: When you’re offline, you can read your mail and write replies in an Outbox, where the messages are saved and then sent as soon as you’re connected. But that’s not the most noticeable thing about the extension. Gmail Offline looks nothing like Gmail. It features a dual-pane interface, where you can toggle the left pane to show either messages or labels, while the right side shows the current thread, so you can move quickly between email conversations. This split view is now available on Gmail’s regular Web interface, but the aesthetic is completely different. Whereas the regular Gmail is flat and minimalistic, the Offline version is much more colorful, with subtle gradients and large, chunky buttons. Gmail Offline can either be used as an alternative Gmail interface while connected, or as an offline client. The regular version of Gmail supports far more shortcuts than Gmail Offline, but many of the essentials are here: You can compose a new message, reply, forward, archive, and more—all using the keyboard. Most of the shortcuts that are missing are for functions that Gmail Offline doesn’t have, such as chat. Overall, Gmail Offline is an excellent addition to the regular Gmail client, and a new way to use a tool you probably depend on every day. No matter how much you love Gmail, it could always do more for you...and with one or more of these helpers, it will. If you want a streamlined, offline-friendly Gmail, Gmail Offline is a good pick. Markdown Here enhances the look of the emails you send, and Right Inbox for Gmail tracks them. Checker Plus for Gmail alerts you to incoming missives. If you spend a little time with Keyrocket for Gmail, however, you may soon find you don’t need any more extensions at all. This Chrome app adds offline support to Gmail, so you can read and reply without being connected. KeyRocket for Gmail teaches you to use the keyboard shortcuts while you work with Gmail.